Being at the beach means a guy’s got a lot of time to ponder. To just sit and think. Since it was the howlidays, I thought I might make a few New Year’s ArrrOOOOOsolutions. So I did. I must be better at barking on my furiends’ blogs. I visit, but I don’t bark a lot. Sometimes I do, sometimes I don’t. And I get frustrated because I’m not a Google account holder, or stuff like that. And you know I have no patience. So, if it’s difficult, I don’t do it. Shame. On. Me. I must finish updating the Blogtionary and post the revised version. I must do this soon. I must be better at barking at my furiends who bark at me here at The Scottie Chronicles. I read each and EVERY ONE. I really do. My furiend Riley got upset because I don’t bark back. That cut like a knife. Sorry, Riley. Guess that’s why you don’t bark at moi anymore? I must be better at this. I must update my blogroll. Oh…it’s been too long since I’ve done that. Actually, I did it the other day, but I must add all of my new furiends’ blogs so that you can go visit them too. I must kiss my peeps more. Like I did when I was a puppy. It’s a rare day when I give the peeps any kisses. Shame. On. ME. And I’ve got several trips that I must update you about. I haven’t given a good trip report in ages. What’s wrong with me???? And, I must go take a nap. Right now. I’m good at that. And I don’t have to ponder that too much. It comes naturally to me. 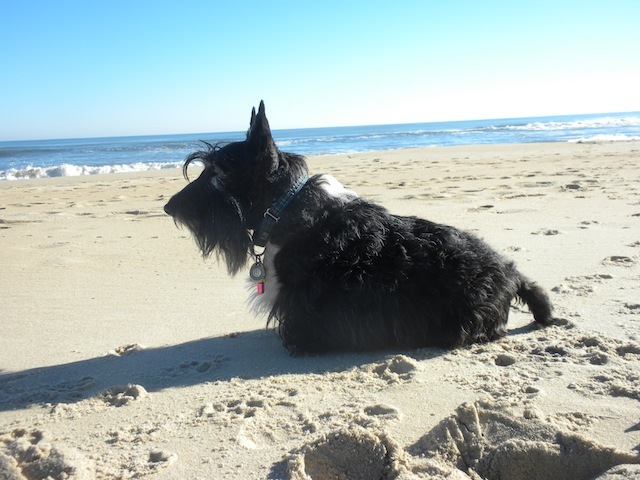 This entry was posted in The Scottie Chronicles and tagged beach, dogs, humor, New Year's Resolutions, pets, Scotties. Bookmark the permalink. I used to kiss Them a lot. Not so much anymore. Sigh. Those are pawtastic Roo-so-lu-tions! I sure hope you can accomplish each and every one (especially the naps, those are super important). I will do my terrier best to accomplish each and every one. Yes. I. Will. Thanks for popping by. It’s hard to remember to bark at everyone! I get a sore throat just thinking about all the barking I have to do. But I think true furiends understand as long as we make an effort! A sore throat….ROFL…that’s a good one. I hope they understand. I think they understand. You included my furiend. They do! Easy peasy! Like you EEEEEZZZZZZZ! I guess that covers it from Aroo to Zonk. You know it does. Hey! I get my very own dehydrator later this week! Would you like me to send YOU something???? Don’t answer that. I left that wiiiiide open didn’t I? OK, no response from me. I kiss my peep every day when she comes home from work. She grabs me and I kiss then I want to get down as I do not do the huggy stuff just one kiss then I’m gone. You have a LONG list to work on but I like the last one the best. They do grab you don’t they? I used to like it. But I’m not sure anymore. Kisses. Blech. OH Bacon. How are you? Happy New Year! Kiss that Houdini. Whee wrote some resolutions for our bloggy today too! How odd is that? Whee think whee should add napping to ours too though! I need to pounce over to your place to see YOUR resolutions! Cool. Well, Stuart, we’ll resolve to bark at you more often, too!! Great resolutions ~~~~ most important one is ….MORE KISSES…. this world need more kisses ! so…sweet kisses to you Stuart and peeps…. I thought so. Thank you! Pucker up….ROFL…..Weeeeeeee! That’s a funny one. Hope you’re OK.
Thats a big list Stu….better make that a long nap so you can get a lot of it done by dinner time….cause you know us pups, after dinner is get a little nap to get ready for Nightie night! Nightie Night is my favorite time. Almost. We are tired from just reading all this. You are ambitious! Now we need a nap. Good luck! See…I thought so too, but I’m confident I can do it. Thanks! That is some list, Stuart! We are sure it was made with the best intentions, most New Year resolutions are, but don’t pressure yourself to get them ALL done! It’s better to do some really, really well than to not do any of them! Just relax, chill, and do what you can, that’s all any of us can do! Good luck! I’ll join ya on dat nappin resolution. One thing in Sophie’s favor is that she always gives kisses. That will cover a lot of bad behavior. That is quite a list Stuart. Quit being so down on yourself. We luvs you for who you are! Don’t worry Stu, we need to add some of those rooo-solutions to our list too.